Thirty-five years ago art critic David Bourdon described Ed Ruscha as "a sort of cowboy Magritte gone Hollywood," but Ruscha has resisted the connection as too simplistic. In excerpts from a conversation with Curator Lynn Zelevansky, Ruscha talks about influence, Magritte, and a meeting between the two artists in Venice in June 1967. LZ: You never said Magritte was a source for you. You said that you were sympathetic to certain aspects of his work. ER: Well, that's a good word, "source," because he wasn't a source for me. You know, I've painted pictures with light blue skies, and people would say, "Oh, that must have come from Magritte or it could have been influenced by Magritte," and I find that hard to believe myself; it's just too pat. I was more influenced by Duchamp and Kurt Schwitters and Max Ernst, but I recognized Magritte as a powerful figure. I first saw his work in a book on surrealism in the Oklahoma City library. I just sort of stumbled across it. I guess I didn't respond to his work as much as I did to the other artists. Only later on did I see something simpatico there, something that I might have shared with him. And you know, I don't feel like he's an outsider at all. 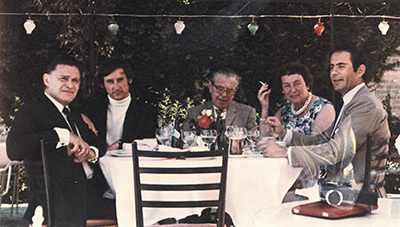 Image: Hotel Cipriani, Venice, Italy, June 1967: Left to right, Alexander Iolas, Ed Ruscha, René Magritte, Georgette Magritte, Paniotas Skinnas. Edward Ruscha Studio, photo by Danna Ruscha. "We went to the Cipriani to have lunch and they said, 'I'm sorry, you can't bring dogs in here.' And he said, 'Well, then that's it. Wherever I go, LouLou goes.'" LZ: You mean that kind of contradictory stance also has its appeal? ER: Yes. Duchamp did the same thing. He dressed that way. I subsequently met Magritte shortly before he died. It was in Venice, Italy. I spotted him in a gondola  he was with his dog LouLou and his wife Georgette and his dealer, who also happened to be my dealer at the time, Alexander Iolas. We waved and met up and had lunch together. We went to the Piazza San Marco and Magritte had his camera with him. He'd never been to Venice before. ER: Never been to Venice. He was a little-traveled person. I asked him if he had ever been to the U.S. and he said, "Yes, Houston." ER: It's the only place in the states he had ever been besides New York. LZ: Did he speak English? ER: A little bit, yes. We went to the Cipriani to have lunch and they said, "I'm sorry, you can't bring dogs in here." And he said, "Well, then that's it. Wherever I go, LouLou goes." And then there was a little bit of chatter, and they ended up finding us a nice table outside in the garden. So we had lunch in the garden with LouLou and Georgette and Iolas and another man who worked for Iolas and my wife and me. In the Piazza San Marco he was photographing artists who were painting pictures of the Basilica. So he was actually photographing scenes that he had painted beforeyou know, a canvas on an easel with somebody in front of the painting and the scene continues behind the easel. Talk about ironythere it was. LZ: What was Magritte like? ER: His demeanor was that of a total gentleman, a kindly man, and that was really impressive to me, knowing this man's work. I hadn't done an intensive study of it, but so many of his images by that time were known to the world, although actually he didn't become really popular until after he died. His work was well known and well collected before he died, but I think the main thrust of his exposure came afterwards. That's my opinion. 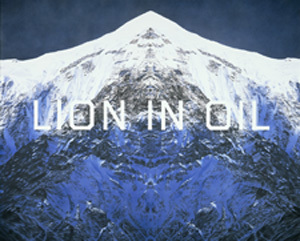 Image: Ed Ruscha, Lion in Oil, 2002, acrylic on canvas, 162.6 x 183 cm, Fisher Landau Center for Art, © Ed Ruscha, photo courtesy Gagosian Gallery, New York. ER: You know his painting Time Transfixed the one with the train coming out of the fireplace. LZ: Yeah, that's an amazing picture. ER: I have always held that to be maybe my favorite image of his. LZ: Do you know why? ER: No, I don't, except that there is the unlikeliness of it. 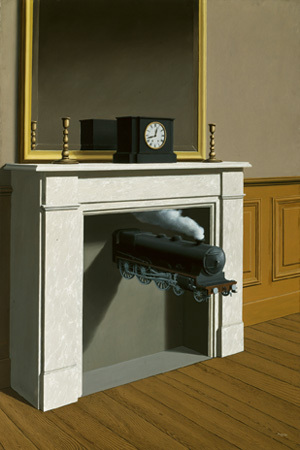 In our daily lives we don't see trains coming out of fireplaces. So that's a number one good thing for that picture. There's an unreality, or a misreality there. And then there's the reality of the exhaust that the train is pushing out. The smoke that comes out of the engine is going back up the fireplace, and that brings you to some sort of rigorous truth. I mean, isn't smoke supposed to go up fireplaces? ER: The struggle between the unreality and the reality of the painting is the right kind of struggle to make a great picture, and I think maybe that's why it could be my favorite. LZ: I think it's often interpreted in Freudian sexual terms. ER: I hope it is. It better be. It is sexual. It is all those things. And there is the titling of the work, which leaves you somewhat baffled. Time Transfixed. This excerpt is from the catalogue for Magritte and Contemporary Art: The Treachery of Images, an exhibition on view at LACMA from Nov. 19, 2006, to March 4, 2007. The catalogue is copublished by Ludion and the Los Angeles County Museum of Art. Image: René Magritte, Time Transfixed, 1938, oil on canvas, 147 x 99 cm, The Art Institute of Chicago, Joseph Winterbotham Collection, 1970.426, © 2006 C. Herscovici, London, Artists Rights Society (ARS), New York, photo © The Art Institute of Chicago (1970.426).